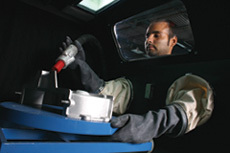 Pressure blast cabinets are used when heavy impact is required - deep cleaning, high-roughness needs or aggressive “shot peening”. 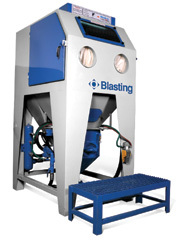 This equipment combines blast, recovery, reclaim and cartridge filtering systems technology in one efficient, tight enclosure of the Zonda and Zonda 12-10 blast cabinets; with the power of pressure blasting systems, ASME-coded vessel and a control circuit operated by pneumatic foot pedal. Rubber-coated interior; Screen fixed to the hopper; Pneumatic control circuit; 4, 5 or 6 mm. diameters nozzles. Angular and spherical metallic abrasives.